Albert Pujols is an ageless wonder who has long been a thorn in the side of the Texas Rangers — back in the 2011 World Series with the Cardinals and since then after joining the Rangers' division rival Angels. But the Rangers might catch a bit of a break this year as it appears Pujols could very well start the year on the disabled list and miss up to seven games against the Rangers that are scheduled over the season's first month. Pujols had surgery this winter to repair a broken foot and Angels skipper Mike Scioscia told local reporters that the club has no plans of speeding up the rehab process to get Pujols back for Opening Day even though they think he could. He added they don't want to risk further injury to have him back a few weeks earlier than originally planned. That original plan could have Pujols on the disabled list to start the year, and the Rangers second series of the year is at the Angels from April 7-10 for four games before they meet again in Arlington for three games from April 29-May 1. 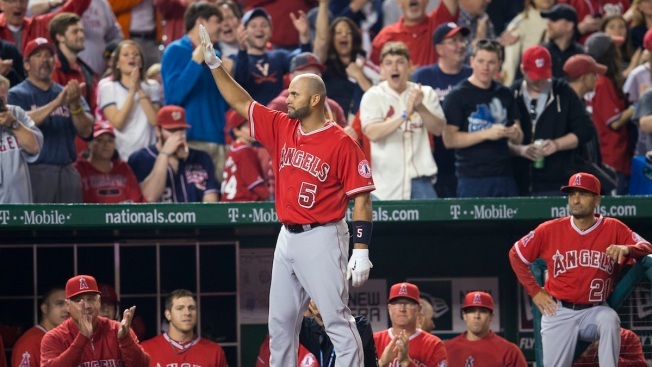 Pujols had three homers and 14 RBIs in 19 games against the Rangers last season. He has 13 homers and 46 RBIs in 64 career games against the Rangers.